Dr. Jinqiang Hou will be joining the Thunder Bay Regional Health Research Institute on Monday, October 1st, 2018, as a Lakehead University-Thunder Bay Regional Health Research Institute Research Chair. Dr. Hou will also be an Assistant Professor in the Department of Chemistry at Lakehead University. The role of the Research Chair is to promote research, teaching, training, commercialization, and knowledge transfer in the area of novel molecular imaging-based diagnostic technologies for disease prevention, early detection and image-guided treatment. Specifically, Dr. Hou will be responsible for conducting a research program related to radiochemistry. “Dr. Hou’s expertise will support a growing clinical research cluster that is exploring solutions to regional health care challenges – solutions that often have global applications,” said Jean Bartkowiak, President and CEO of Thunder Bay Regional Health Sciences Centre and CEO of the Health Research Institute. Dr. Hou joins the Health Research Institute and Lakehead University from the London Health Sciences Centre in London, Ontario, where he worked as a Postdoctoral Research Fellow. He completed his Ph.D. in Medicinal Chemistry, Department of Pharmaceutical Sciences, at the Sun Yat-sen University in China. 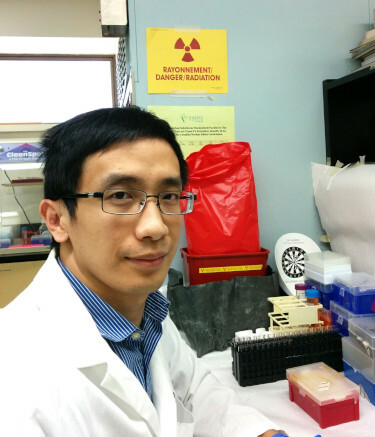 Dr. Hou’s research has centered on the discovery of Positron Emission Tomography (PET) imaging agents for targeted cancer diagnostics, with a particular focus on the development of Fluorine-18 labeled chemical entities for potential use in the imaging of various diseases using PET. Dr. Hou plans to develop his research further by focusing on radio-tracer/drug discovery for targeted cancer diagnostics using PET, with the goal of contributing to the integration of PET imaging into drug discovery. “The Lakehead University-Thunder Bay Regional Health Research Institute Research Chairs program is an excellent example of collaboration that provides the best research environment for emerging scholars. Dr. Hou will be joining a vibrant community of researchers who are engaged in the discovery of new methods and technologies for medical imaging,” said Dr. Andrew Dean, Vice-President, Research and Innovation at Lakehead University. The arrival of Dr. Hou is part of the Health Research Institute’s plan to recruit three new scientists in radiochemistry, biophysics, and smart health technology. The positions, which involve joint appointments at Lakehead University, will build on the Health Research Institute’s strengths and prepare for a new era of health care, particularly in relation to health technology in remote regions and addressing the Indigenous population’s health disparities.